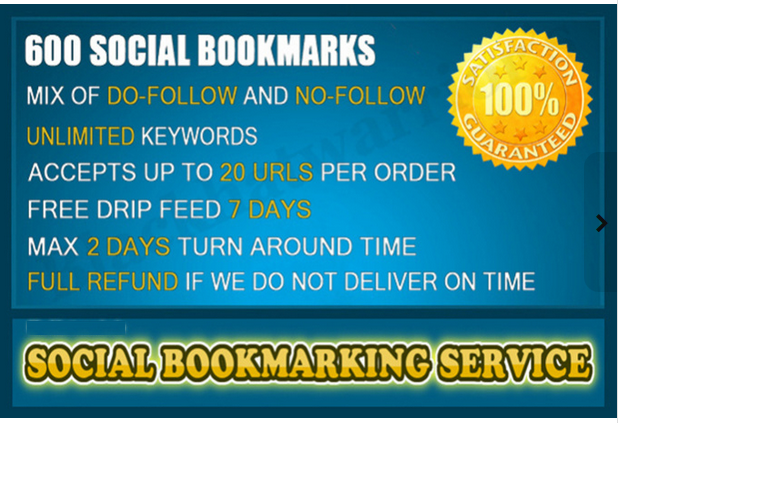 Social Bookmarking is one of the best ways to get quality one way backlinks. It not only helps to get listed and to gain the highest rankings in the Search Engines, but also increases your Site popularity and puts your Website in front of thousands of active internet users. If you are serious about your site's ranking and SEO then Social Bookmarking is a must. For a low price of $5 we will submit your website url's to more than 600 Social bookmarking sites with different domains. A mix of Do-follow and No-follow links will be created on High Page Rank (PR 0-8) sites using different IP's. Our service is 100% Google Panda and Penguin compliant. We accept upto 20 URL's with unlimited keywords per order. Spinning privilege for Title, Description, Tags and URL's as well. Backlinks will be Pinged and submitted for Indexing at lindexed. Foreign languages allowed if using UTF-8 characters. After an order is complete, we provide you with a full report of every website where your link is placed in. You will love our service, give us a chance. Order Now !